What Is Use Baby Sign Language? Baby Sign Language is a collection of easy to remember, simple gestures or 'signs' that hearing babies can use to communicate with you long before they have the words to speak in sentences. Through Baby Sign Language, babies can express their wants, needs and thoughts, such as being hungry or thirsty, tired or sick, or wanting to read a book or play with a toy. You may already be using some aspects of Baby Sign Language without even knowing it! Have you ever noticed how easily babies copy us and learn to wave 'goodbye' ...clap their hands... blow kisses, or shake their heads for yes and no? Encouraging baby to copy such gestures is something most parents do naturally without consciously thinking about it. 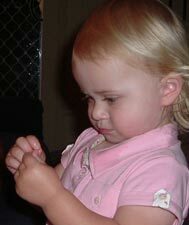 Baby Sign Language takes this form of communication one step further as babies learn simple signs to illustrate a whole range of wants and needs in their little world. Best of all, using Baby Signs helps improve intellectual development - and helps babies to talk sooner. For more information on the benefits of Baby Signing, click here. Copyright © 2005, Tinytalk. All rights reserved.